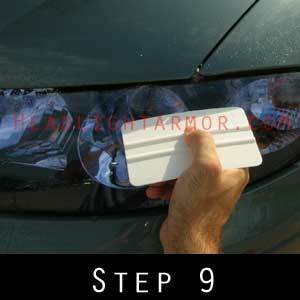 Clean the lenses. Clean your hands. 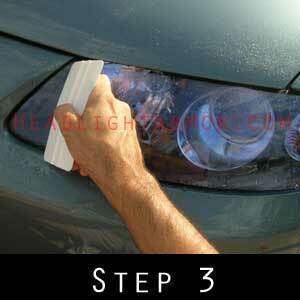 Make sure there are no residues from the cleaning process remaining on the lenses or your hands. Without removing the lens cover from the backing paper hold it up to the lens and make sure you have the correct one / orientation (i.e. Slightly ovoid lenses). If it is cool - below 65 degrees F gently warming the lens with a hair dryer will help things along. Wet down one lens with water - a clean spray bottle / plant mister works great. Carefully remove the cover from the backing paper - handling the adhesive as little as possible. Mist down the adhesive side and gently place on the lens. Handling the edges align the front lower corner of the piece - (left side of the photo) then generally align the remaining edges. The piece will be 'floating' on the beads of water on the lens. Be gentle the adhesive is pressure sensitive. Verify alignment and then squeegee the front corner - about the first 3-4 inches. Then re-wet your fingers and lift from the back corner to the point you just squeegeed and mist down with water. Align the far back corner. Verify alignment and then squeegee the back corner - about the last 3-4 inches. Verify alignment of the center section - top to bottom. 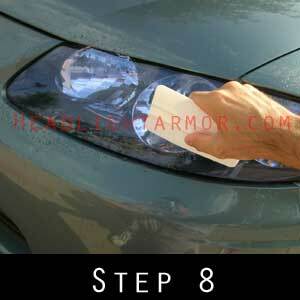 Mist the surface down with water and squeegee firmly from the inside corner you started at toward the back corner directly down the center line of the headlight. 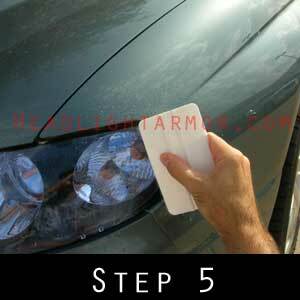 When you get to the far end be sure NOT to squeegee into the area you set in Step 5. 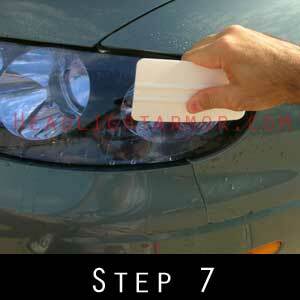 Instead turn your squeegee down and out. 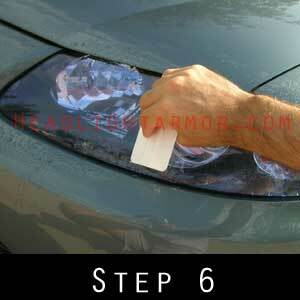 Step 6 and 7 are most effectively done in one motion - no lifting the blade. This helps to avoid leaving a bubble of water behind. 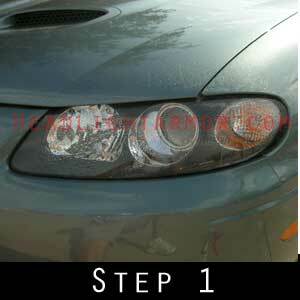 Mist down the outside surface again and firmly squeegee from the centerline you just set down halfway to the bottom of the light as shown from one end of the headlight to the other. Continue to the very bottom of the kit until all film has laid down. 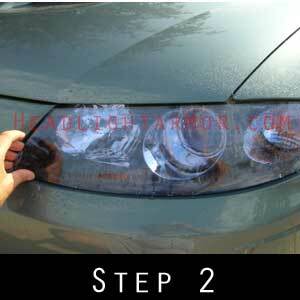 Doing this in two steps helps distribute the material evenly around the compound curve of the headlight. For the next step misting some additional water under the film at the top may be necessary if it has dried out a bit during the previous steps. Repeat Step 8 on the remaining material at the top of the kit. NOTE: This kit was installed with ambient air temps ~90 degrees F. If it is cool out the use of a hair dryer on low will be necessary for steps 8-9. Do not overheat the film, you just want to warm to about 90 degrees F. If you have any areas that are misaligned or overhanging you can either wrap the edge if it a flat surface or simply trim off the excess with a very sharp razor knife. 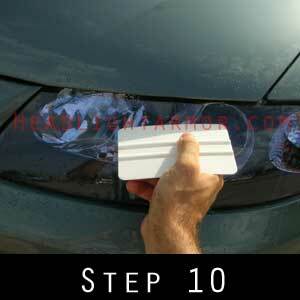 Go over the edges with a suede detail cloth / paper towel wrapped squeegee to make sure the edge is fully set. Gentle heat from a hair dryer on low can help things along if it is cool out. Now you are done, stand back and enjoy! With our HID Blue protective headlight covers you will be able to change to look of your vehicle while protecting your headlights from being sand-blasted to death. 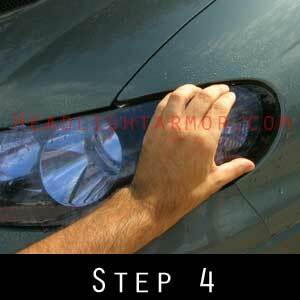 Our HID Blue film was designed to mix with the light from your headlight and produce a bright white beam! You can remove these at some point in the future if you are so inclined - though they can only be used once. Please don't wash your car for 3 days post install.